Participants in the Oil and Gas Industry Project Management Mentoring Programme, which is co-ordinated by the Engineering Construction Industry Training Board (ECITB). The achievements of a group of mentors and their mentees in the oil and gas industry have been celebrated at an awards ceremony in Aberdeen. Construction Industry Training Board (ECITB). The six-month scheme allows qualified and experienced project practitioners to impart wisdom and provide guidance to less experienced project professionals with the aim of accelerating their performance and careers. To date, almost 50 participants have benefited, many of whom are working towards chartered status with bodies such as the Association for Project Management. 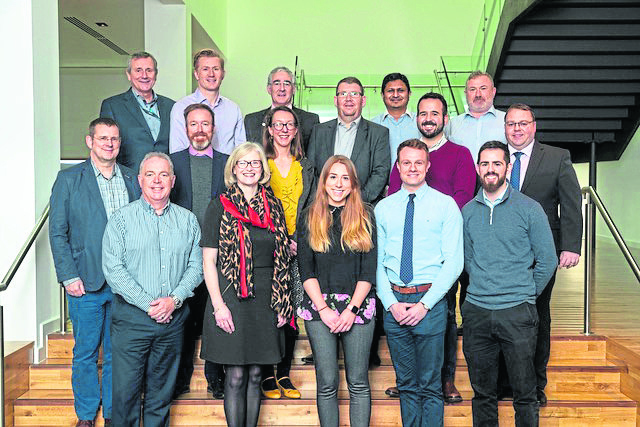 Management Steering Group (OPMSG) set up a pilot scheme to mentor 14 young oil and gas professionals from the Aberdeen area. It has attracted interest as a blueprint from across the country and other parts of the engineering construction industry, such as nuclear decommissioning. A number of others successfully completed the Association for Project Management’s Registered Project Professional (RPP), a pan-sector standard for those able to demonstrate the capabilities of a responsible leader with the ability to manage a complex project. Chris Claydon, chief executive of the ECITB, said: “The delivery of projects to world-leading standards is vital to the future well-being of the oil and gas sector. “Our project management mentoring programme shows how industry can put aside commercial interests to co-operate for the benefit of the sector as a whole. “The ECITB is proud to support this and the other project management development programmes that the OPMSG is leading.